If you’re clumsy, or have kids, your kitchen cupboards are probably filled with ugly but necessary plastic drinkware. 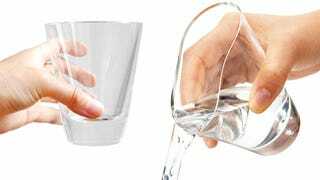 It doesn’t have to be that way, though, because it turns out someone has created crystal clear drinking glasses made from squishy, shatterproof silicone. Silicone bakeware and other kitchen accessories already exist, but they’re usually completely opaque—making them look like cheap plastic. They won’t break when accidentally dropped, but you also probably don’t want to use them to serve guests, or even your clumsiest of visitors. But somehow this glassware, called Shupua in Japan, is made from flexible silicone that’s completely transparent, making it look just like glass. You can squeeze it, you can drop it, you can even toss it in the sink from across the kitchen and it simply will not break. And because it’s made from silicone which is a poor conductor of heat, the Shupua glasses will also help insulate a cold beverage, and even reduce the amount of condensation on the outside so they’re easier to pick up on a humid day. They’re not cheap, though. You’ll have to import them from sites like Amazon Japan and depending on the size of the glass you choose you can expect to pay about $15 for each one. However, because they’re so durable there’s a good chance you, your kids, and your kids’ kids will be using them for decades, so—like pricey LEDs bulbs—in the long run they might actually be a bargain.